NEW YORK, New York, May 31, 2013 (ENS) – Protecting the environment must be at the core of efforts to end extreme poverty by 2030, finds a high-level panel whose 27 members include UK Prime Minister David Cameron, Indonesian President Susilo Bambang Yudhoyono, Liberian President Ellen Johnson Sirleaf and Queen Rania of Jordan. 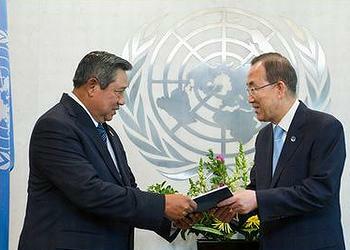 Panel Co-chair President Yudhoyono delivered the report Thursday to UN Secretary-General Ban Ki-moon, who immediately presented it to the UN General Assembly. Entitled “A New Global Partnership: Eradicate Poverty and Transform Economies through Sustainable Development,” the report of the High-Level Panel of Eminent Persons sets out an agenda for the period following 2015 – the target date for the Millennium Development Goals, MDGs. The agenda aims to eradicate extreme poverty by 2030 and deliver on the promise of sustainable development. 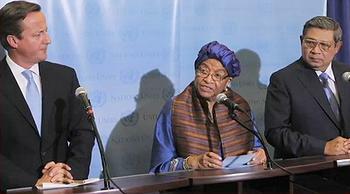 disasters and too dependent on deteriorating oceans, forests and soils,” the panel wrote in its report. The report is intended to build on the eight Millennium Development Goals agreed on by world leaders at a UN summit in 2000. The goals set specific targets on poverty alleviation, education, gender equality, child and maternal health, environmental stability, HIV/AIDS reduction, and a Global Partnership for Development – all by a deadline of 2015. While the Millennium Development Goals will not all be achieved by the 2015 deadline, the panel found that much progress has been made. “We came to the conclusion that the moment is right to merge the poverty and environmental tracks guiding international development,” states the report. Proposed goals to secure food, water and energy for a growing world population should include key targets for safeguarding sustainable agriculture, fisheries, freshwater systems and energy supplies, the report says. The secretary-general emphasized that sustainability is not just an environmental matter, but an approach that integrates the economic, social and environmental dimensions of development, as agreed last June at the second UN Conference on Sustainable Development, Rio+20. “I am truly convinced that we must act now to slow the alarming pace of climate change, which poses an unprecedented threat to humanity. And we must act now to profoundly transform the ways our economies work,” Jeremić said. The United States was represented on the panel by John Podesta, chair of the progressive Center for American Progress and the Center for American Progress Action Fund. 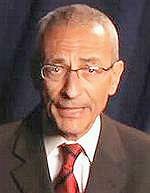 Before founding the Center in 2003, Podesta served as White House chief of staff to President Bill Clinton. 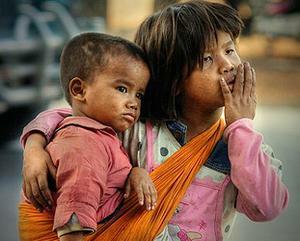 “Since the Millenium Declaration, more than 600 million people have moved out of extreme poverty around the world. That’s a tremendous achievement and was made possible in no small part by the Millenium agenda, Podesta said Thursday in a video commenting on the report. “The MDGs have fallen short in some areas, but we can take important lessons from the places where we fell short as well as where we achieved ambitious goals,” he said. “We know now that we must react to global climate change with urgency and purpose, working to curb greenhouse gas emissions while also helping countries build resilience to climate and extreme weather shocks and environmental degradation,” he said. The panel began its work in September and has held consultations with more than 5,000 civil society groups from 121 countries across every region of the world. Panel members spoke to experts from multilateral organizations, national governments, local authorities and the academic and scientific communities, as well as 250 companies from the private sector. “Nearly 15 years on, there is finally recognition that poverty cannot be eradicated and the well-being of people across the globe cannot be secured without addressing the grave pressures on the environment and the natural systems that support human life on this planet,” Leape said. Leape said the report has the potential to influence over US$25 trillion of development spending and marks a clear break from the practice of treating development and sustainability as separate topics. Secretary-General Ban, who established the High-Level Panel in July 2012, will draw on the recommendations of its report for his own report to the UN General Assembly in September.